My Grandma turned 87 this year and she is still an avid cook. This recipe is a real comfort food for me. 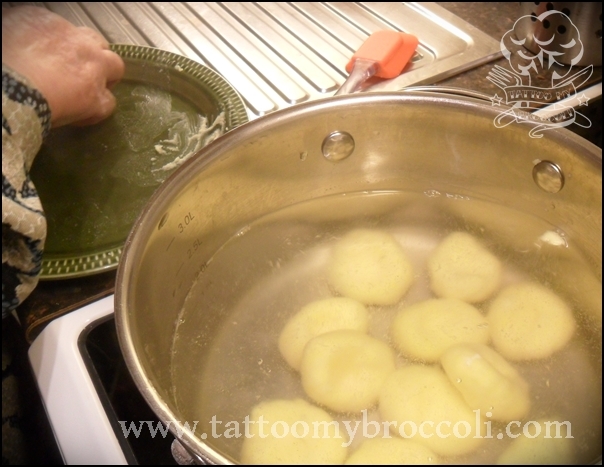 I’ve made it many times in different ways, adding spinach to the dough and other variations but this is the very simple, basic recipe for the delicious ‘kluski’ dumplings. One amazing thing about them is that they don’t require for you to have some great manual skills, like many other dough dumplings. I have always loved their smooth, slightly chewy texture and very delicate flavour. 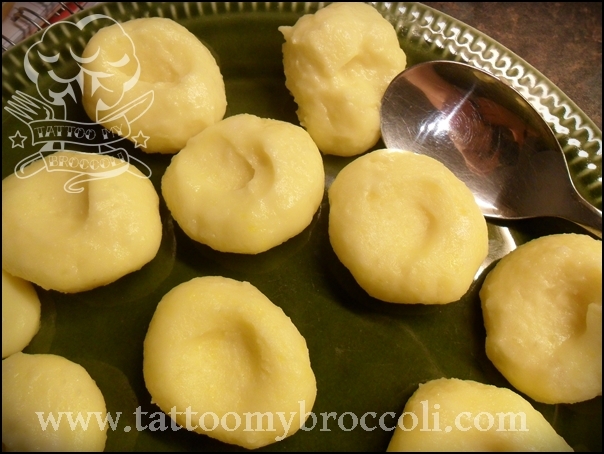 If you like the Italian gnocchi you are likely to enjoy these Polish kluski as well. The chicken that comes with them is really, really simple and maybe nothing special but I wanted to give you the real experience – this is my Grandma’s real recipe, how she made it for the last 50 years at least and at least two generations have already enjoyed it immensely. This amount feeds approximately 4 people for a light meal or 3 for a bigger meal. 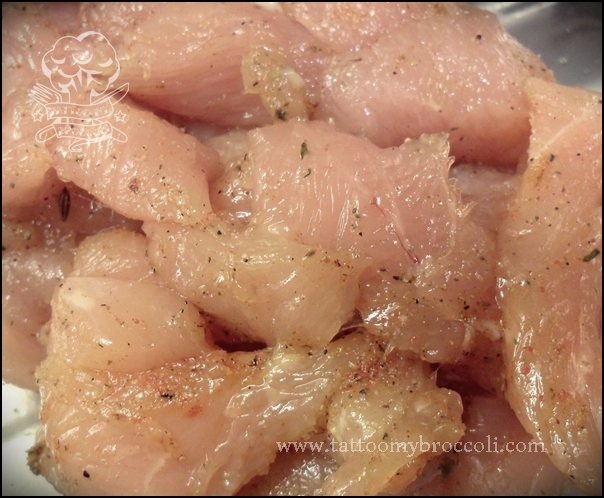 First, cut the chicken meat into small pieces and add salt, pepper, paprika and garlic. Stir and leave in the fridge to marinate for 1 hour. Next make the kluski the following way. 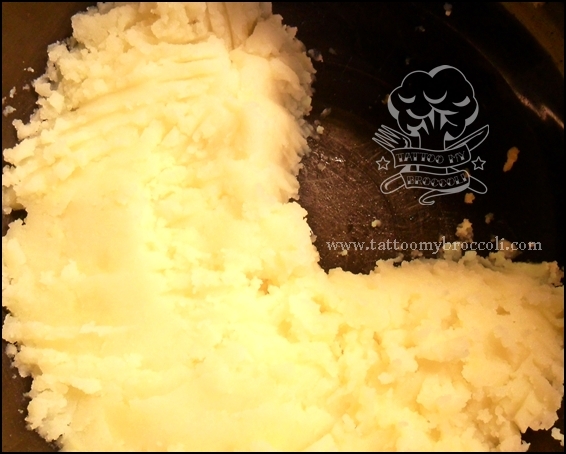 Take the potato mash and spread it in the bottom of a bowl in the way pictured, so that it covers three quarters of the bottom with one quarter of the space empty. 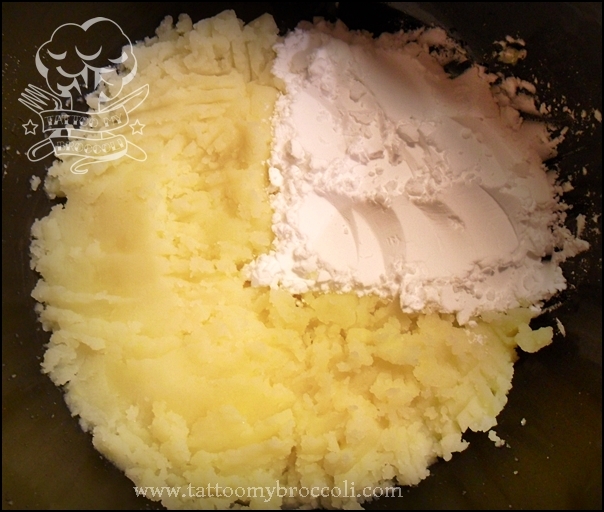 Next, fill the empty space with potato flour. 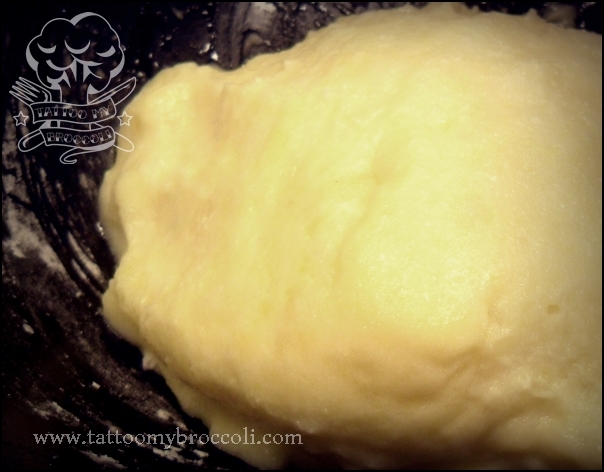 This is how it will always work, no matter how much potato mash you have exactly, if you follow this method, the kluski will always be delicious. 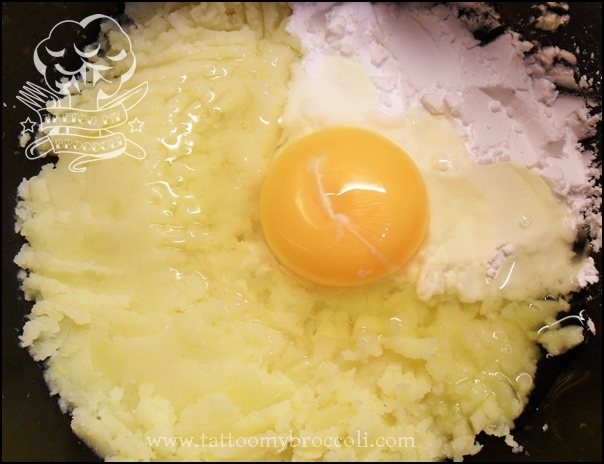 Add 1 egg and mix well. Grandma says that there is no need for another egg until you’re cooking for 5 people and using more potatoes. Now form a dough ball and start making kluski with your hands. First roll them into balls and then flatten and make a little impression with your thumb in the middle. This will ensure they cook all the way through and they will have a delicious little well for sauce. Now, let the kluski wait on a plate and back to the sauce. 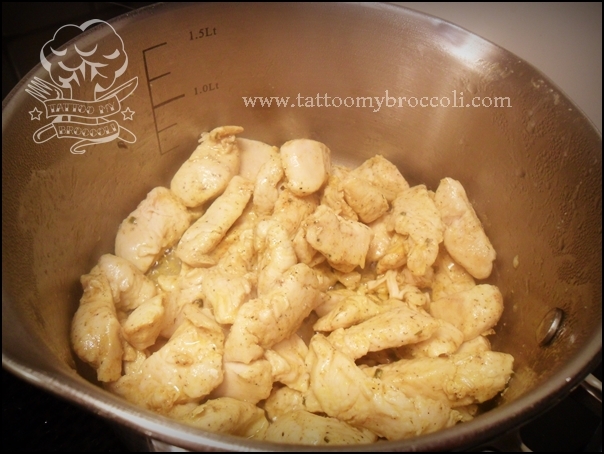 Heat the oil in a saucepan and put your chicken on it. Fry it until all meat becomes white and there are no more raw/pink pieces. 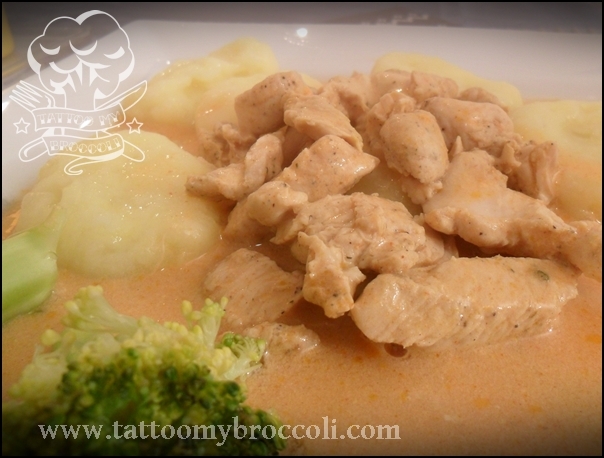 Once you are sure the chicken is not raw, add 2 Tbsp cream, the tomato puree and water from the kettle. Stir so it doesn’t stick and let boil under a lid on medium heat for 15 minutes. 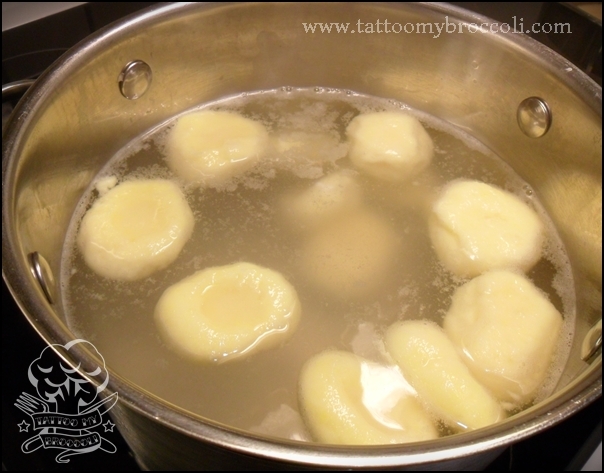 Once ALL of the kluski are swimming on the surface of boiling water, count 5 minutes and they should be perfect right about then. Try one if not sure. They should be soft and slightly chewy. Their texture should be very smooth and velvety. 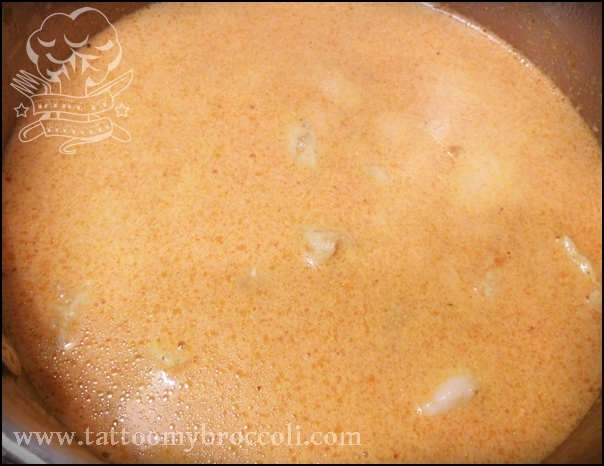 To thicken the sauce surrounding chicken, put the remaining cream in a cup, add wheat flour and stir. Add to the boiling sauce and stir until well blended. Serve the kluski with the sauce on top. I added some steamed broccoli. 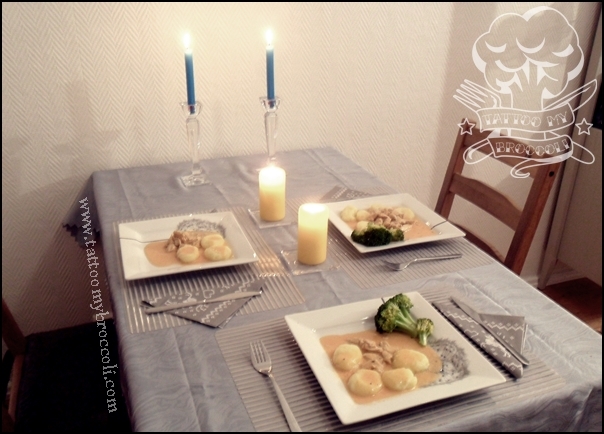 Enjoy this delicious, comforting meal.